MAGUS Group Coaching develops leaders by expanding their leadership capacity and capability. Our mission is to help develop leaders who make a difference by delivering results, leading change, and inspiring others. We work with leaders in a group setting, and individually, to coach them to their fullest potential and best selves. And we help them learn to self-coach and keep developing throughout their lives. Find out more about our coaches. "This book reads like reality TV, with educational and transformational potential!" "Great resource that is a quick read!" 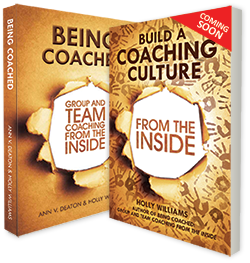 "Executive coaching can be difficult to describe, and team coaching can seem a little mysterious. But finally, here's a book that puts you in the middle of the process. This is as close to coaching as you can get without actually being there."